When Taína Asili took a cathartic sledgehammer to a TV playing news clips in the video for her protest anthem “No Es Mi Presidente” (Not My President) people took notice. But Taína wasn’t satisfied: “The video featured important activists from my community, but no one heard their stories.” Taína makes sure those stories will be heard on Resiliencia, her third album (Release: April 19, 2019). Taína Asili, a New York-based Puerto Rican singer, songwriter, activist and filmmaker, has been creating fiercely political music since her teen years. After the 2016 election, a bigger audience has caught up to the artist Huffington Post named one of “12 Freedom Fighting Bands to Get you Through the Trump Years.” That’s when Taína performed at the Women’s March in Washington DC, and her whip-smart protest songs “No Es Mi Presidente” and “Freedom,” inspired by social movements against white supremacy, mass incarceration, and police violence, were lauded by the likes of Rolling Stone and Billboard. The attention Taína Asili has earned is bringing her new opportunities to speak and sing, at conferences like Columbia University’s Beyond the Bars and at venues like Carnegie Hall with Toshi Reagon. Resiliencia is just as political, but its power springs from personal stories. “I’ve been so inspired by the powerful, resilient stories of women of color in my life and I wanted to lift them up in song,” Taína explains. “Before I started writing songs, I conducted interviews with women from New York and California to Montreal and Puerto Rico.” While Taína met many of these artists and activists through social justice networks, their conversations delved into the common ground of personal experiences with adversity and resilience, from surviving cancer, hurricanes, and domestic violence to the joy of creating art. 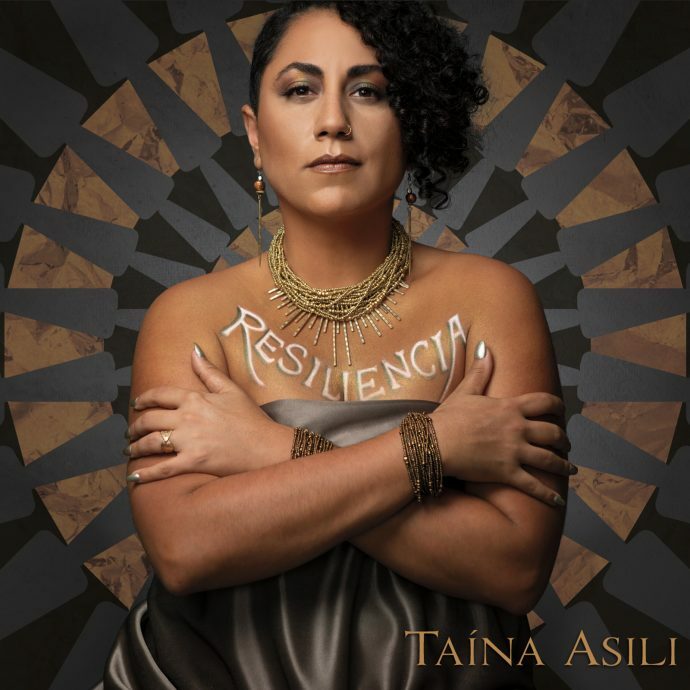 Taína tapped into the powerful connections she explored in those conversations to write the songs on Resiliencia. While Resiliencia was taking shape, adversity took on tragic proportions in the devastation wrought by Hurricane Maria. “I had already planned a trip to Puerto Rico, but after the hurricane, it became more urgent than ever before to witness and record what happened on the island,” Taína recalls. The album’s title track distills the emotional interviews Taína conducted and her experiences there, channeling anger at U.S. neglect of Puerto Rico’s suffering into a hard rock guitar lick that testifies to Taína’s punk past and adds a defiant edge under the Afro-Latin melody. Taína’s music draws from the Puerto Rican and Afro-Latin rhythms of her upbringing and from her own artistic journey, which ranges across operatic vocal training, punk rock, and spoken word. Taína confidently shifts and weaves between cumbia, reggaeton, ska, salsa, Afrobeat and rock to give Resiliencia a texture that’s unique yet rooted. With an energetic horn section and infectious rhythms on timbales, drums, and congas, Resiliencia urges people to get on their feet, not only to march for justice but to dance to the rhythm of rebellion. This movement is joyful. Resiliencia is full of women’s stories of the kind that have gone ignored for too long, like “En La Verdad,” a meditation on the power of believing survivors of assault and abuse. If you’ve been looking for a soundtrack to power your own daily acts of resistance, it is here: rock out to “Beauty Manifested” while you defy white hetero-patriarchal beauty norms, and celebrate establishing healthy boundaries with Taína’s energetic salsa fusion rendition of poet Sussy Santana’s “Decir Que No (To Say No).” Fittingly, this feminist album was mastered by Emily Lazar, who just became the first female engineer to take home the Best Engineered Album Grammy. To amplify Resiliencia’s stories further, Taína is pairing the songs with ‘music video documentaries’ that blend produced a music video with footage Taína filmed of the interviews she conducted. Resiliencia and “Plant the Seed” are already racking up views, and more videos will follow throughout the year. Raised in upstate NY by a musician father and dancer mother who centered Afro-Caribbean music and the importance of cultural reclamation, Taína explored different strands of music, poetry, and activism. She played punk rock with bands Anti-Product and Ricanstruction, performed spoken word on the Philadelphia poetry scene, and earned a master’s degree from Goddard College in Transformative Language Arts. After losing her parents, Taína brought all she’d learned to a deeper exploration of her family’s musical heritage. On Resiliencia, Taína opens her sonic embrace even wider, welcoming collaborators like DJ Johnny Juice, best known as Public Enemy’s producer, and Veena Chandra, a virtuoso sitar player in her 70s. Taína has a gift for focusing on the point where the individual stories of the women she’s interviewed intersect both with her own experiences and contemporary social currents. Each song has the specificity of an intimate conversation or a personal declaration, but Taína’s poetic sensibility—and powerful singing voice—endows them with the communal power of anthems. Taína creates magic out of that delicate balance between the individual and the universal. This is rooted in a place and time, but open to sounds from all over. It’s activist music that acknowledges how collective movements are built on the wisdom and experience of individuals. It’s no wonder the world is catching up to Taína Asili: this is the music we need.